CNN reports: “Rep. Ilhan Omar faces backlash over AIPAC comments.” See commentary by Glenn Greenwald on “Democracy Now!” Monday morning. 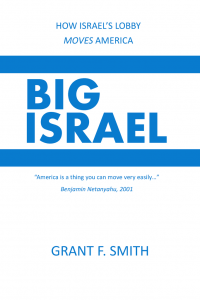 Smith is director of the Washington, D.C.-based Institute for Research: Middle Eastern Policy and the author of the 2016 book, Big Israel: How Israel’s Lobby moves America and America’s Defense Line: The Justice Department’s Battle to Register the Israel Lobby as Agents of a Foreign Government. Background: “Watch the film the Israel lobby didn’t want you to see” — an Al-Jazeera documentary leaked to the website Electronic Intifada.